Reinhold Schlegelmilch produced what collectors consider to be R.S. Prussia (RSP for short) in his factory in Suhl, Germany, from the late 1800s through World War I. Following the war, the factory moved to Tillowitz, Germany, and after World War II the factory once again shifted venue, this time to Poland. R.S. Prussia pieces were and continue to be highly valued, though individual pieces may be more or less expensive depending on a number of factors. Throughout its history, the R.S. Prussia company manufactured a wide range of china pieces and sets, including teapots, cups and saucers, plates, sugar bowls, and even chocolate sets. Most pieces were decorated with imitation opals, gold, or iridescent finishes and features paintings of flowers, portraits, or scenes from nature which were applied through lithographic transfers. Later pitchers and vases pieces, influenced by Art Nouveau, had arms and handles with designs similar to the borders on posters by Alphonse Mucha. According to the International Association of R.S. Prussia Collectors website, most of the historical information on this type of porcelain published prior to 1994 appears to be largely inaccurate. This includes large chunks of text in a few well-known book titles. Reinhold and Erdmann Schlegelmilch were long thought to be brothers jointly operating one factory, but they actually ran two different factories located in Suhl, Germany. Yes, they were in direct competition with one another. Collecting organizations often continue research for years ferreting out truths and discarding inaccuracies, which is another good reason for joining up with them to exchange information whenever possible. Collectors devoted to research provide some of the most useful resources available on many different topics, including R.S. Prussia. Decoration and Quality. When considering the desirability of R.S. Prussia, don't forget to evaluate the way it is decorated and the quality of the porcelain. Some RSP pieces were more carefully decorated than others. To fetch top value, this porcelain should be delicately crafted and finely finished. Floral decor generally considered more common, doesn't command as much attention as pieces featuring portraits, animals, classical, and scenic themes. In addition to beautiful decorations, various finishes adorn many RSP pieces. Some have "jewels" decorated to imitate opals, others have a finish similar to the iridescent look popularized by Tiffany and Co. Lavish gold embellishments enhance many of the gaudiest, and most popular, RSP pieces. Marks. Those pieces marked "R.S. Prussia" in red lettering surrounded by a green wreath were made at the turn of the last century. This is sometimes referenced as the "red mark" by collectors. 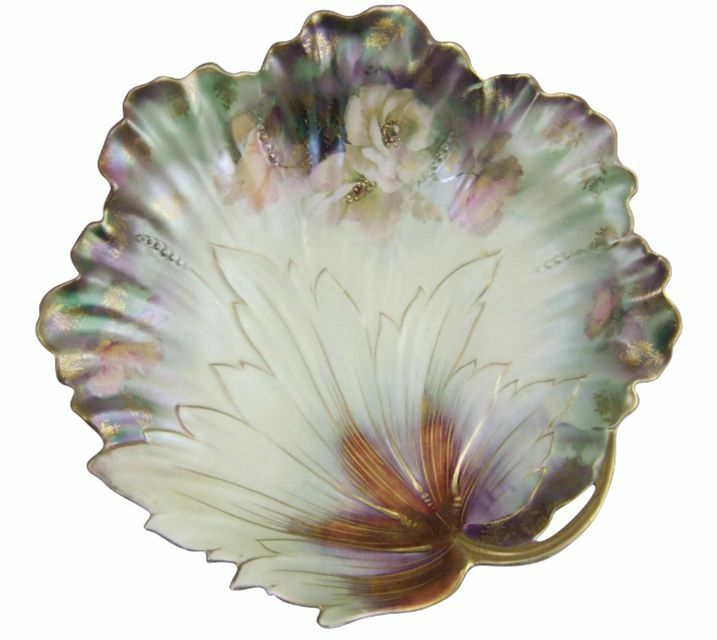 It remains the most popular and recognized mark among fans of this type of porcelain, although a number of others were used. A number of unsigned pieces also left the factory. Learning to recognize these can offer the most bargain potential for thrifty shoppers and dealers looking to make a profit. While signed pieces generally hold more value, especially with common floral pieces, unsigned RSP decorated with portraits and other highly desirable motifs still bring high prices. The same holds true for extra fancy mold shapes. Mold Shapes. Evaluating the various mold shapes is another interesting aspect of learning about this porcelain. Molds used vary from simple to extremely ornate, and with most avid collectors, the fancier the better. Blown out flowers, ornately shaped handles, and spouts, and beautifully curving finials all add to the appeal of RSP. Chocolate pots with matching demitasse cups and dresser items such as hatpin holders and hair receivers were all made by the Schlegelmilch factory in addition to the more common bowls, plates, and creamer and sugar sets most frequently found. Those preferring simpler lines can also find RSP examples to suit their taste. Some of these pieces can be pricier than the ornate items, depending on the theme. A plain vase with a lion and tiger motif could have been marketed for $10,000 to the right collector in the past. Prices have leveled off for these items now, although these pieces are still considered rare and valuable. The same type of vase with floral decor would probably sell for far, far less, even when marked. Many RSP treasures have held up extraordinarily well. Still, all pieces need to be checked for damage before they are purchased as there are a number of porcelain pitfalls to consider. Knobs on coffee pot lids, teapots, and sugar bowls should receive a thorough inspection as prime candidates for being re-glued after being broken off. Running a finger along bowl edges, plates, and pots will detect any rough spots where chips and less severe "chigger bites" may be hiding. Holding pieces to the light can indicate cracks and glues used in repairs. Some people even carry a pocket-sized black light along while shopping to help detect repairs since the glue will often fluoresce when held under ultraviolet light. Just because a piece has been repaired, especially if it's a rare item, doesn't mean it shouldn't be purchased. However, the quality of the repair should be considered when determining value. Only pieces with professionally applied repairs should bring top prices in the secondary marketplace. Heavy, thick porcelain in comparison to the delicate nature of most R.S. Prussia. Items decorated plainly with modern-looking floral decals and a lack of hand painting. Mold shapes never produced by the RSP factory that have wreath marks similar to those found on genuine pieces. Price points will vary from year to year depending on collectors' tastes and trends. These prices are not a guarantee of value, but they do provide an idea of relative costs.